Partisan Belief Superiority and Dogmatism as a Source of Political Gridlock - How Do You Think? Are you sick and tired of politicians and their antics throughout the United States? Regardless of your political orientation, this is likely the case. Over the last 20 years there has been a rising tide of bitter partisanship, leaving a large contingent of US Citizens feeling frustrated and disenfranchised. Meanwhile both parties point their fingers at their adversaries proclaiming that it is the ideological extremism of the other party causing the divide. The liberals are accused of promoting socialistic policies while the conservatives are accused of acquiescing to religious and corporate interests. Underlying this partisanship are two driving concepts, dogmatism and belief superiority. Dogmatism is generally conceptualized as ideological rigidity. This is characterized by the holding of beliefs as “incontrovertible and sacrosanct,”1 with a conviction that the beliefs cannot, and should not, be abandoned. Belief superiority, on the other hand, is self defining but it lacks the rigidity factor. One can hold a belief as being superior to the beliefs of others, but be willing to modify that belief based on evidence or changing societal values. Consistent with previous research findings, those espousing more conservative attitudes scored significantly higher on the dogmatism scale. Thus the Rigidity of the Right Hypothesis was supported while the Ideological Extremism hypothesis was unsubstantiated. In other words, extreme conservatives scored much higher on the dogmatism scale than did extreme liberals. 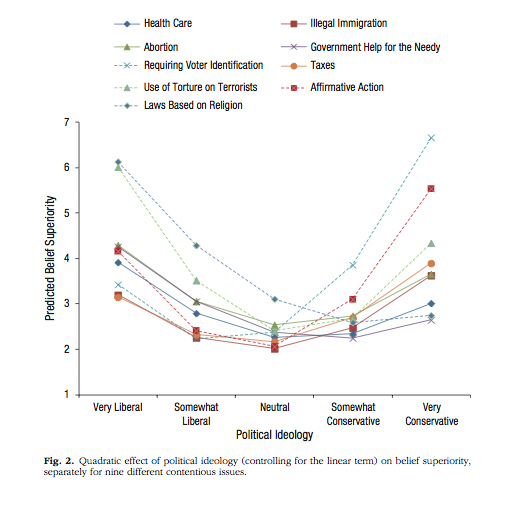 With regard to belief superiority, both conservatives and liberals demonstrated this attribute, but on different topics (see Figure 2 below from Toner, et al., 2013). Specifically, people who endorsed conservative attitudes expressed greater belief superiority than did liberals when asked about voter identification laws, affirmative action, and taxes. Liberals demonstrated greater belief superiority on the issues pertaining to the role in government in helping the less fortunate, the use of torture on terrorists, and the basing of laws on religious teachings. The more “extreme” one’s attitudes were, the greater their belief superiority tended to be. Although certainty and confidence are attractive in leaders, it is exactly these very attributes that render politicians ineffective. Life and society are complicated. There are no easy solutions. What I took away from this study is that we need collaboration among diverse and intelligent thinkers who are unencumbered by dogmatism and extremist ideology. We, as a people, must stop feeding into the vitriolic nature of politics and look for leaders who are more willing to work together to solve complex problems. We must stop feeding the monster, before it eats us up. One important way to end this is to stop attending to extremist political pundits who stir up hatred and polarize politics. We all know who these pundits are. The reality is that media driven hatred and fear mongering drives these phenomena and it is commercial Television and Radio that gives these pundits a platform. Perhaps it is time to hit their corporate sponsors as they are complicit in spoiling the well. « American Exceptionalism: I’m all for it!